Determined to be the next big star, Ah Kit joins a Cantonese Opera troupe. He works hard to prove himself and gradually falls for the Manager’s daughter, Fei Mui. The current superstar incumbent, Fui Koh, feels increasingly threatened by his presence. 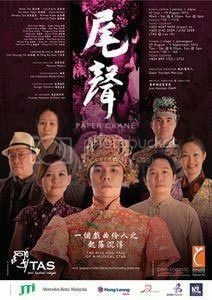 I quite enjoyed Paper Crane, despite my rudimentary Cantonese comprehension (though much better than my understanding of Mandarin). The play predominantly in Cantonese, which probably hampers enjoyment if you understand nothing at all. I do wish that there had been a little more English dialogue but fortunately many of the songs were in English. The Cantonese songs were a little lost on me, sadly. The set design, costume design and lighting were much better than I expected. I have almost no complaints about it in those departments except that I wish the ensemble had had slightly more variation in their brown outfits, and that the final scene (where Ah Kit sees visions of the people in his life) had been lit with a more surreal lighting scheme. The set was an efficient use of space, well-arranged and well-lit. The fire projection was quite well done; nothing spectacular, but served the purpose without looking entirely stupid (to me). Vocals were good, with Lee Elaine and Colin Kirton being the standout singers, I think. It was nice to see Patrick Teoh on stage too – he still has that pleasant “comfortable” voice that’s enjoyable to listen to. haha I thought the ensemble songs were nice, but maybe there’s still some diction work needed. I didn’t find it difficult to follow most of the songs, but my parents and sister said they couldn’t make out the words. I liked the songs. The melodies were really maybe the closest thing to typical Broadway stuff that I’ve heard from a local Malaysian production. I would like the songs even better if I had been able to understand the Cantonese lyrics. They should have included song lyrics and the translations in the programme. That would have made the programme even more useful. The scene-by-scene breakdown was good, since they opted not to have surtitles, but really, there ought to have been translations for the songs as well. The story was quite easy to follow, though it seemed to falter a bit towards the end and the epilogue was rather vague. The scene breakdown was absolutely essential to me for the epilogue because I wouldn’t have understood anything without it. I can only remember one scene (at the moment) that I found kind of ridiculous – the scene where the opera goes up in flames. I did not understand why on earth the troupe members should just be taking turns to run to and fro and stop to gape at the fire. It looked a bit silly and odd. Apart from that, I thought the rest of it flowed well. There was no plot point that jumped out at me as being illogical or a weird plot hole, and that’s a good thing. One thing’s for sure: Paper Crane demonstrates that Malaysia is getting better at this theatre thing. But from the little I’ve seen of Malaysian stage work, we’re definitely improving. The last one I saw was Malaysian Girls, and though that was a good attempt, Paper Crane is better. ahahaa. Good thing I didn’t go then. I would have been totally lost. BUT! I’m still planning on Empress Wu in KLPac. Apparently… dialogue is in English, songs are in Mandarin. Bwahaha. wish me luck. Or a translator.